Tell us about your business: How did you get started, what's your process, how do you see your business evolving? Describe the moment you decided to start your business. I have created functional wood eco-art furniture from reclaimed wood and found objects my whole life. As a child I took treasures I found outside and turned them into things that could be used inside such as stools, benches, doors, etc. I was very inspired by my elementary school art teachers, who saw my potential, and my shop teachers and professors. A change in direction came when, as a late teen studying art in college, I inherited my grandfather’s business of painting contracting. It seemed like the most responsible way to earn a living, so my art career was put on hold. A number of years later, a shoulder injury and my wife’s teaching contract ended up opening the door for me to finally work on my art full time. I soon became frustrated, however, with people mistaking my original art for refinished furniture, so I created a series of pieces that morphed from broken, rescued wood on one end to a finished and functional cabinet on the opposite end. This series of studies was a great career transition for me. It got me one step closer to the amazing contemporary images I see in my mind and opened doors to some very prestigious fine craft shows. Art collectors and fellow artists became my greatest patrons and my dedication to function was successfully integrated into a trinity of art, reclaimed/rescued wood, and function. The wood I use has been “born and raised” on American soil. These Pennsylvanian trees might have provided food or shelter to animals and Native Americans and later service to the settlers to protect their farm equipment and harvests. Imagine all the wood has witnessed and the endless stories that lie buried in its rings and chiseled in its bark. I work with Pennsylvanian logs decaying in the forest and remnants from old outbuildings. I see amazing potential in wood that has weathered the storms of life. 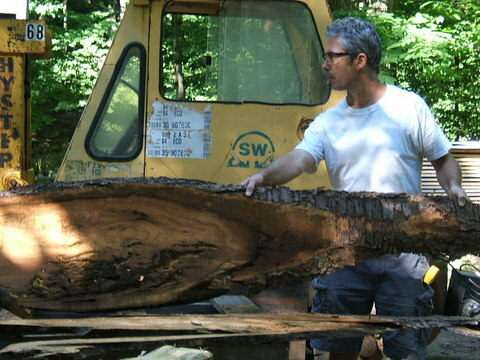 My “Angel”, a retired PA public school woodshop teacher, who is also my friend, owns a lot of woods and has a saw mill. He is willing to cut fallen trees that most would say are too far gone. Because of him, I have the chance to explore these forgotten trees and give them another chance at greatness. The barn boards, on a pile to be burned, seem fragile and weary from their long years of service, so I rescue them and re-purpose them. To me, the deep texture and markings of decay are pure art. I transform the wood into one-of-a-kind American heirlooms and, after highlighting Nature’s unique signature on each piece, I add my own name. America has always been about giving the weary, fragile, and forgotten another chance at greatness. I work outdoors all year long. I have always been an outside kind of guy, playing soccer or working with wood. I create my green art on our forested, creek-side land and I have work tables all over the property, depending on if I need sunlight or shade. For years my 2 dogs were my constant companions, whether outside, at my side, or inside, lying by the wood stove in my wood shop (garage). Although my dogs are finally catching squirrels in Doggie Heaven (Squirrel Hell), I still have my chickens running around by my feet. A community of feral cats, that we rescued,spayed and re-released, peek out at me from under my wood piles. I usually have my old, paint flecked radio on, with its copper-wire-rigged antenna. I live across the street from the neighborhood's original one-room-school-house and we are two houses down from an old world paper mill, the name sake of our road. Our home and garage (my wood shop) were built by our neighbor Anna, who lived to be 99 ¾. The old wood inspires me and it feels good to preserve some of it. As an eco artist/conservationist, I rescue and salvage wood to minimize waste and because it is irresistibly attractive to me. I have a passion to make highly original art of some kind and when I work with the old wood, it feels like I am just continuing an art project that was already started. The curiosity about what's inside the decayed log and the curiosity of about the best use of a broken board is very motivating to me. It is the wood itself that seems to direct me as to what to make and how to make it. I follow the flow of the wood and try to place in the spotlight the interesting grain or markings. I want to make it so others can enjoy it in their home, so I often give it some function. It is a shame to see some of this wood go to waste and it feels good to preserve some of it. To me, the wood is already art and I want to bring this art from the burn pile and the floor of the forest to the center of people's homes, positioned in places of honor. My wood eco-art is an interesting mixture of natural beauty, spiritual metaphors, re-purposing and humor. My organic designs come from the distorted boards I rescue. The natural form of the old broken boards and the partly decayed wood informs my art. I feel like I was a broken board that God rescued and my art tells this story. I also believe we are all disabled (some of us hide it better than others). The weak and fragile have unique strength and beauty and my art embodies the respect and honor due those who are wrongly judged. To balance the depth of this symbolism, I add my humor by shocking people with secret compartments, removable walls or tops, false bottoms, concealed drawers, or backwards-opening doors. The interaction between the art and the audience is magical. It is very humbling to confirm, time and time again, that my pieces appeal to all people regardless of age, faith, sexual orientation, nationality or wealth. “No trees were harmed in the making of this wood art." I do not believe in computers and I am pretty sure they are going out of style any minute. However, my wife is a techie and she is relentless about the marketing potential of the Internet and social media. From the beginning, she insisted on a website and my domain name had to be my name alone. She spends endless hours on the website and social media platforms, promoting my art career and communicating with the public about what I do and how I am progressing. She wanted the name of the Facebook Page to attract strangers, so she created a series of key words that describe my art. She updates the Facebook page with news, art shows, awards, videos, interviews and anything she feels will help my art supporters and patrons feel excited and connected to my art career. She has me on Linked In and You Tube and she creates beautiful newsletters through Constant Contact. We have above average opens and clicks and we receive a lot of emails in response to the newsletters. The best business advice I have ever received was non-verbal. The examples of the older men of integrity in my life guide me: My dad who got up and went to work, every day, no matter what; Bob, the construction worker/pastor who fixes plumbing, with sewer running down his arm, even though it is unseen and unsung; Elvy, master builder, who made a wall too high, realized it, and, without hesitation or complaint, tore down his hard work and made it right; Nick (trucker-turned-pastor) who went through every hard thing you can imagine and yet never complained or became negative and always has time to help others and listen; Ken, who taught me that if what you're working on isn't working, work on something else - just keep working and things end up getting done; Uncle Bob who showed me why I needed to start factoring creativity into my prices, not just my time and materials (which is hard for me). I am so grateful for the amazing example of these & many others in my life.